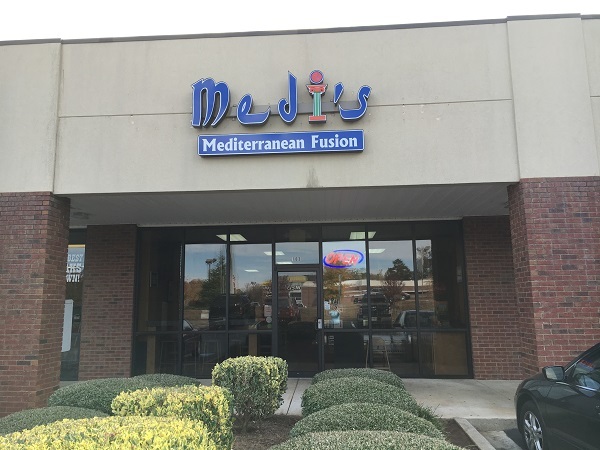 Medi’s Mediterranean Fusion, Macon GA – Marie, Let's Eat! For Thanksgiving, Marie took some time to visit her family while I stayed home and worked extra shifts. On her way to south Georgia, she stopped for a good meal. Every so often our paths separate. When that happens, Grant generally gives me hints ranging from “will you eat somewhere new” to “Here, take this money and go somewhere.” This was one of the latter cases. I was on my way to St. Simons from Chattanooga, and it is beyond the capacity of five years old to spent that much uninterrupted time in a car. I had to make sure to schedule a mercy break or two. I’d intended to collect a place in Savannah, The 5 Spot on Habersham Street, on my way back home from my folks’ for this Thanksgiving trip, so I just stopped at a conveniently placed fast food restaurant in Macon to let the poor boy run wild in their playground. However, while there I met another mom who remembered Pig In A Pit from across the road, where I’d stopped a handful of times before. We bonded over tales of baby food allergies and then, as one does, branched out into talking about food, and I mentioned having gone to the restaurant that is no more. She’d really enjoyed it too, and said that there was a brand new place in the same strip mall across the street. 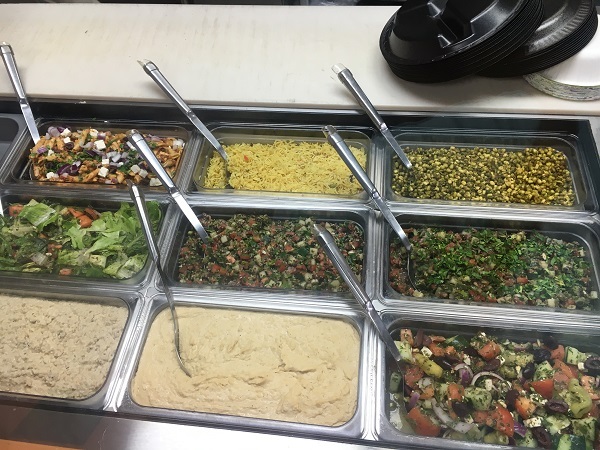 Since Grant loves both Mediterranean and Indian food, it seemed like a good place to spend his money! I must apologize for the poor quality of this photo of my sandwich. As time was pressing due to having let our son play far longer than he should, and having had to drive rather more sedately than usual due of an oppressive number of traffic cops on the roads (thank you for protecting us from ourselves dear officers, but nevertheless you’re annoying), I could only grab a couple of bites there and had to take the rest of the sandwich with me. 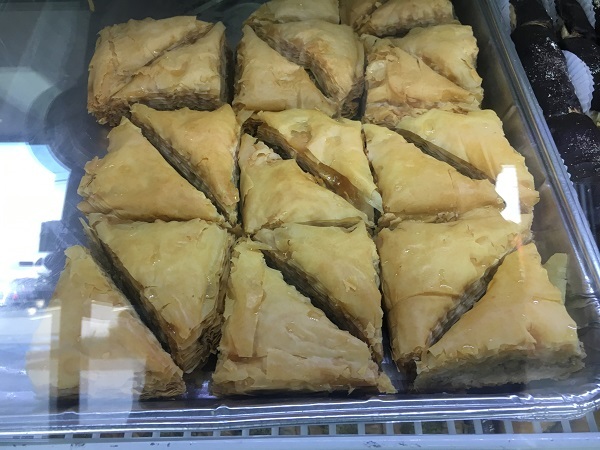 Please note that they have both baklava and “choclava.” My son, bizarre creature that he is, took one bite and then complained the chocolate was squishy (it wasn’t; I checked) but I was thwarted in my attempt to steal the treat from him by the problem-solving employee who somehow understood that he was willing to eat the chocolate just not to touch it. She presented a piece of wax paper to roll it in, which solved the problem neatly. The rest of the dessert vanished in the time it took me to pack up my sandwich to go, and he spontaneously enthused about it to his father after getting home. The employee in the store who rang up my order and told me that she’d known the owner when he used to run a Hovan’s that she had loved, so when she heard that he was starting a new place she came out of retirement to work there! I share this just because it’s generally a pretty good sign of the quality of the food when the employees love it. I believe the lady who made my sandwich is the owner’s wife? Both were super friendly and really helpful. The roll was pressed so it’s nice and warm when served. 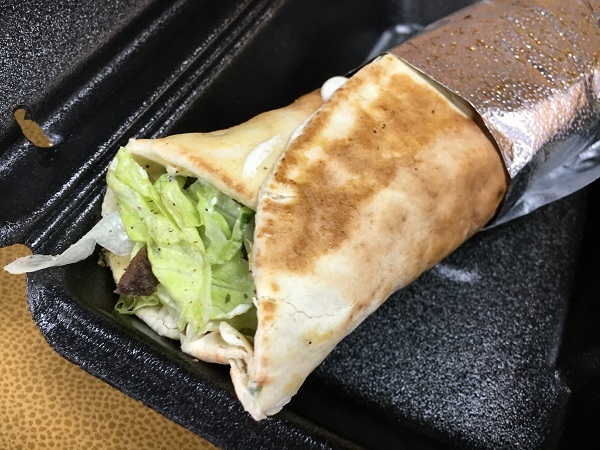 The lamb and beef is really tasty and the toppings blend well. They’re spread on quite generously. I also had a taste of the turmeric rice (has just a touch of heat to it) and the hummus (creamy and perfectly smooth). They opened June 6th of last year. Although the beef and lamb sandwich I had was great, it looks like the vegetarian options are pretty good too. Even though I stopped by a bit late for lunchtime everything looked fresh and beautiful. I would like to go back with Grant and see what he thinks. Recommended and I’d like to try more. Posted on January 11, 2017 by Grant G.Posted in georgia, macon, mediterraneanTagged georgia, macon, mediterranean.